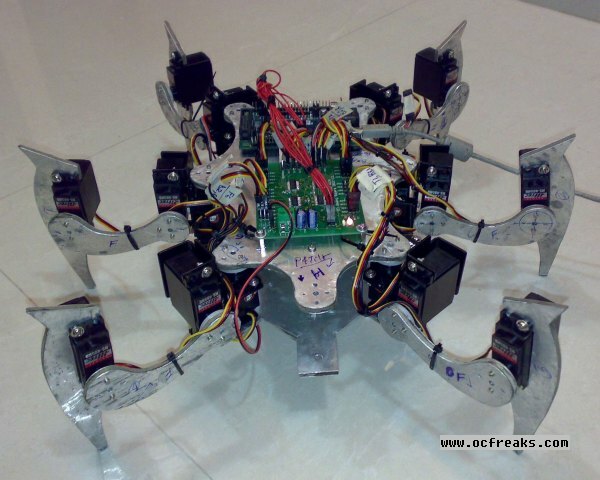 This hexapod was a scratch build project with custom design , electronics , software control and manually cut parts which took quite a bit of time initially. I just had 20 servos and an LPC2148 & LPC1768 development board with me as ‘ready made’ things. 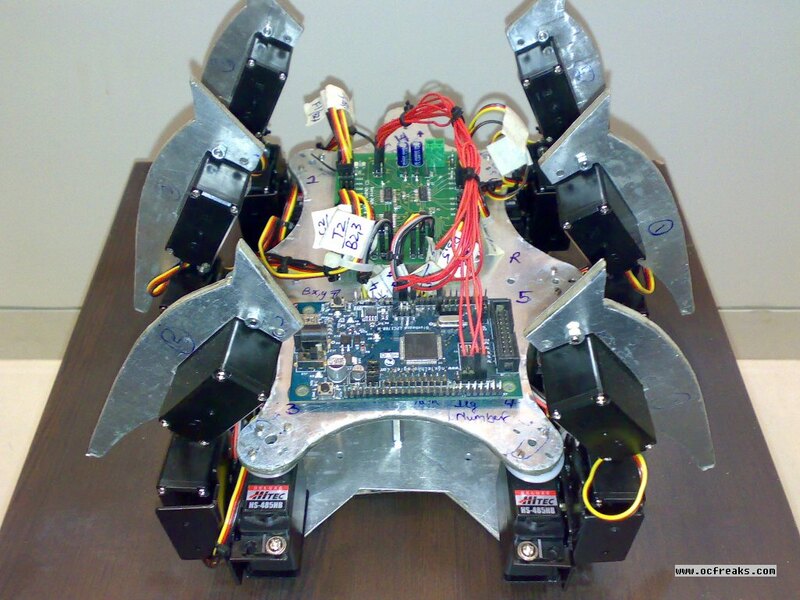 Here are some pics of the ‘Hexapod’ taken in June 2011 after fabricating the body parts at home. I’ve Codenamed it “Harsh”. The first question that comes in our minds is: What do we need to build a Hexapod robot? 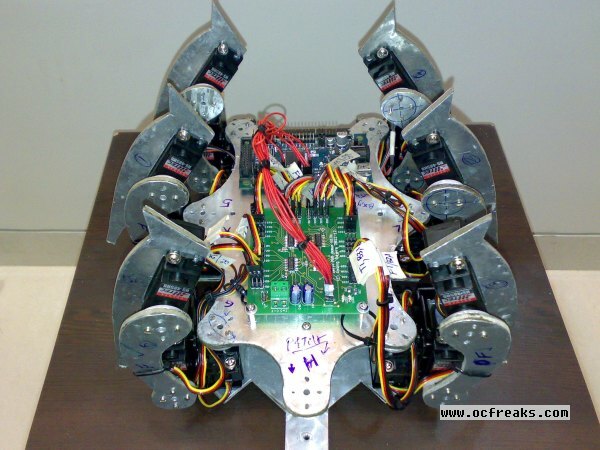 Here the ‘Primary’ major challenges were to design the servo controller in terms of Hardware and Software , work out the Inverse Kinematics for the bot , implement different types of Gaits or ‘Walking Algorithms’ (or what I call ‘Walking Rythms’) and finally figure a way out to make them all work together flawlessly! Secondary challenges include wireless interface using Zigbee , balancing , decision making ability (AI) when left alone , object tracking using camera and what not. Before starting with body design , I first started developing Servo Controller which can control upto 32 (64 too) Servos independently. Then I started work on desinging and cutting body and leg parts for the robot. After that came the toughest part – Inverse Kinematics and then its integration with GAIT generator. At this very moment I am Working on GAIT Generator or Sequencer or whatever its called. This Sequencer controls the movement of legs synchornously for the selected GAIT. I have made the blue-prints of Tripod and Wave Gait.I Had hardcoded the sequences for testing and it seemed to work just fine – so I can safely assume that my method of generating the GAIT sequences is all OK. Now I just need to make a module that can produce the sequences dynamically. Hoping this gets done quiclky after which I can work on generating sequences for complex moves along with Yaw-Pitch-Roll-Translation moves w.r.t to the center of the body. For initial ‘Test Runs’ I used a Computer Power Supply and hooked it up to +5V Rails. After that I bought a custom made 4500mAH Ni-MH battery which provides more than enough juice but the weight also increases. Now I am planning to use a Lipo battery along with DC-DC (6V output) buck converter.